Leonardo Pereznieto is one of the most publicly followed fine artists in the world, with over 1.7 Million subscribers and fans on social media sites, such as YouTube and Facebook. A Mexican sculptor and painter, Leonardo has had 33 solo shows in museums and galleries throughout Europe, USA and Mexico. He's also the recipient of numerous awards, such as the Gold Medal of the Italy Award for Visual Arts and the “Premio Firenze,” bestowed on him by the government of Florence. 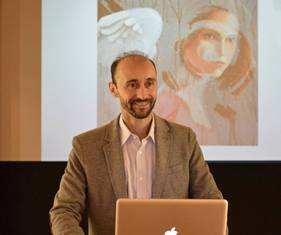 Leonardo has delivered over 50 lectures about the business and practice of art around the world, including at the NY Academy of Art, the University of Michigan and the Estate University in Kharkov (Ukraine). He shares his passion for art with the general public in instructional videos. His popular art tutorials on the Youtube channels “Fine Art-Tips” (in English) and "Arte Divierte" (in Spanish) get over 2 million video views a month. Leonardo is co-founder, together with the writer and art critic Claudia Moscovici, of the new aesthetic movement of “postromanticism”, which celebrates beauty, passion and sensuality in contemporary art.